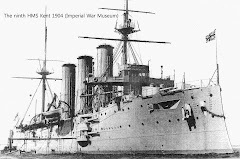 Centenary Service for HMS Kent. I now have details of the centenary service for 8th December 2014. I am particularly trying to contact John Valentine, Damien Hone, and Keith Van Assen, but have managed to lose their e-mail addresses and telephone numbers. A disaster for which I apologise. All are welcome, but those who are related to men who were on the ship that day nearly a century ago are most especially welcome, and a reception will be held afterwards for them in Cathedral House. It will of course be open to the public and parts of the cathedral will also be open to visitors as usual. We regard those who are related to a member of the crew as guests rather than merely members of a congregation, and they are also invited to a private reception after the service. · 1100 Guests and others attend the daily Bell Ceremony in the SW Transept of the quire. This short ceremony starts with the ringing of a ships bell to mark 11am (six bells) and an ex-serviceman turns a page in one of the books containing names of the fallen from all wars and conflicts since 1914. · 1200 Move from the Crypt to the North Nave Aisle. Wreath laying at the HMS Kent Memorial, blessing and dismissal. · 1230 Guests move to the Archives to view the exhibition. This will be open from earlier in the morning until closing time. · 1300 Or thereabouts, invited guests, ie family members, move to the Chapter Room for refreshments. As you can see, the arrangements mean we move around the cathedral, taking in all parts of the building. Please! Can families get in touch with the Receiver-General as soon as possible! Website for the Centenary Service. I have set up a website on the Yahoo Groups site for the purpose of helping to locate families related to crew on HMS Kent that day. It is also hoped to use it to disseminate information about the centenary and allow us at the cathedral to plan for expected numbers. It is not in competition with John Valentine's remarkable site, indeed without his help, support, and encouragement, we would never have got as far as a centenary service. The site will only operate for the remainder of 2014. May I invite all to join it, you will then receive automated e-mails to keep you up to date - and you will be invited to join us in Canterbury in December if you are able to make the journey. Message me with an e-mail address and I'll send you an invite. How to Upload Your Pictures etc.